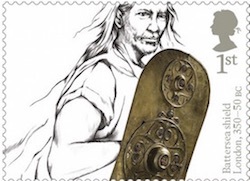 Unannounced Special Handstamps for Ancient Britain stamps. 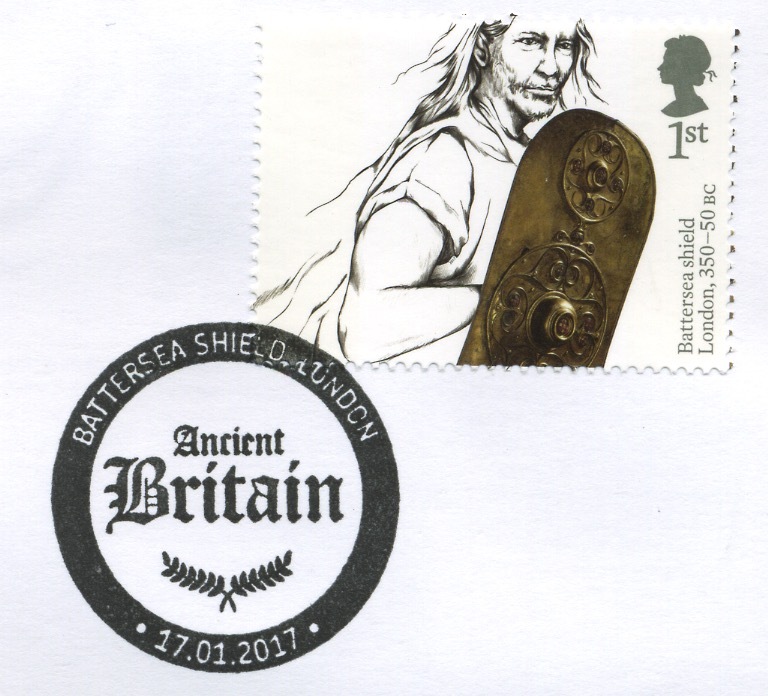 Readers who happen to live close to one of the sites where the Ancient Britain artifacts were found may have read in their local newspapers about a new unannounced special postmark to be applied to all mail posted in a postbox at or near the location. This would apply to mail posted between January 17-21. 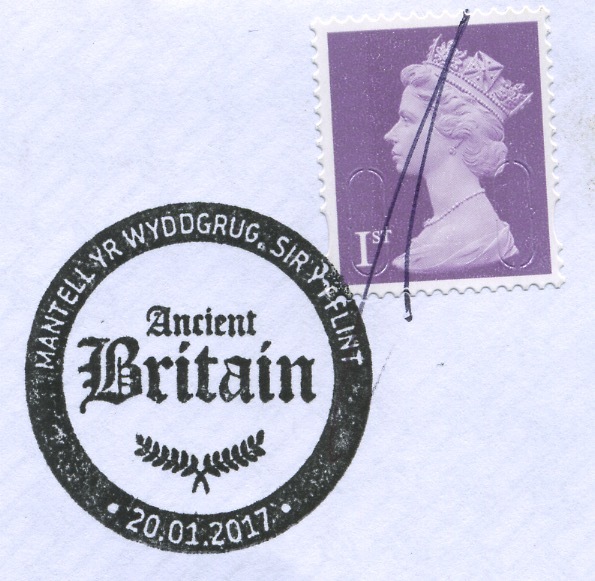 These postmarks were not announced in the Postmark Bulletin and were not available from Special Handstamp Centres using the reposting facility. For example, Norfolk's Eastern Daily Press advised 'To obtain the special handstamp on their Grime’s Graves stamp, customers should post at the postbox at West Tofts Camp near Thetford'. The postbox is outside West Tofts military base, which is the only major habitation in this part of Thetford Forest. The nearby village of Mundford (population 1560) has its own Post Office, and there is another at the town of Brandon, 6 miles away. The permanent population of West Tofts itself is very low, as most of the village is in the battle training area commandeered during world war 2 and not yet returned. In Orkney, The Orcadian advised that "This (Skara Brae handstamp) can only be obtained by posting at postboxes in Quoyloo (Isbister Bros shop) and at Yeldabrek, Sandwick". The population of mainland Orkney is over 17,000 (more than half in Kirkwall but the west of the island consists mainly of isolated villages, fams, holiday cottages and ancient monuments. In Wales, the Daily Post has a video about the Mold Cape, and mentions the handstamp but doesn't indicate where it is. 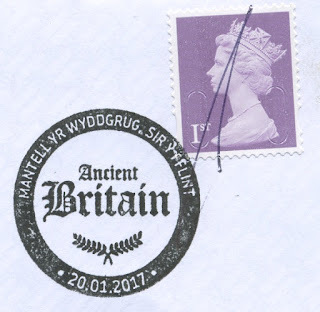 "To obtain the special handstamp, customers should post at the postbox in Ffordd Pentre, just off Chester Road in Mold, between January 17-21." The Press of York, reported that in Star Carr's case the at the postbox at Seamer Post Office would collect mail for the special handstamp. The population of Seamer, near Scarborough is 4,500. For Maiden Castle, the Dorset Echo gives precise information: customers in Dorchester should post at the postbox at the end of Gladiator Green, where it meets Celtic Crescent. The Wiltshire Gazette and Herald seems to have missed the point slightly, writing that "Royal Mail will also provide a special Avebury stone circle handstamp, which will be applied to people’s hands when they post mail at the letter box in the High Street until Saturday (January 21)." I haven't been able to find any references on press websites local to Battersea, or Drumbest in Northern Ireland *. Royal Mail's press release - promoting the stamps - does not specifically say that the handstamp will be applied only to mail bearing the new stamps. I will venture to West Tofts and post some self-addressed items of mail in the box and see what turns up. No all will bear Grimes Graves stamps. I've asked Royal Mail for more details and pictures and will post these here as soon as I get an answer. A similar postmark was used for the Beatrix Potter stamp issue, for mail posted in a box at Hill Top Farm. 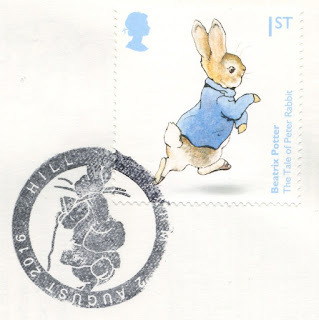 The postmark isn't clear, but the caption only includes the words HILL TOP FARM, and excludes the actual location of Near Sawrey. What has RM got against pre-publicity?